No matter what season it is, Perth is always buzzing with activities with countless days of celebrations, festivals and exhibitions. People from all walks of life can enjoy a trip to this wonderful city, known for its vibrancy. 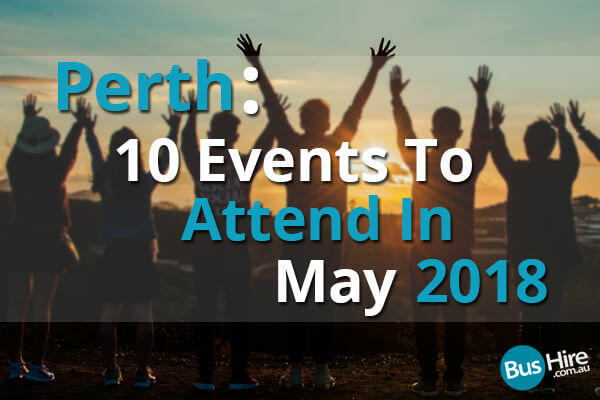 Don’t forget to choose Perth bus hire to attend some of these events in May 2018. Taking part in play-based learning activities can have a soothing effect on your mind. Padbury Picnic club gives you an opportunity to go on a family picnic, as you spread out your blankets under the shady trees and befriend people from other families. Not only is it refreshing and educational, but also fun for the entire family. Do not miss out on the water play, as you would learn to develop hand eye coordination through activities such as squeezing, pouring and squirting. This special 2-day showcase of collectables and antiques will be hosted by The Avon Valley Collectors Club at the Toodyay Memorial Halls, on the 5th and 6th of May. The event will feature a wide range of retro and vintage wares, which you may not be able to find anywhere else. Get hands on various pre-loved items, including a wide array of pottery, glassware, and quality home decor, along with dolls, toys and jewellery. You can find an ideal gift for Mother’s day at the fair! Travel to the town of Toodyay to rejoice the famous mischiefs of Moondyne Joe at the Moondyne festival. On the 6th of May, people from different parts of the town will gather to experience a taste of pioneer life. Wander through plenty of attractions and stalls, as you are entertained by the talented performers. Witness an old fashioned colonial village and period themed weapon displays, along with re-enactment of Moondyne Joe’s many escapes and arrests. Toodyay is hardly an hour’s drive from the city of Perth, and is ideal for a day trip or a weekend stay. The first production of Endeavour Theatre Company in 2018 is set to hit the theatres, with the season starting on the 11th of May, featuring a modern play about reality TV, by Louise Bramley. The company has been performing a wide array of shows, since 1991, and will be taking the stage at the Hamersley Community Recreation Centre this May. There are 5 housemates in the twilight years determined to show they are up for anything. The producers are anticipating to knock into the success of the 20-something TV show appeal, with the only difference being that they are after a mature audience. The black humoured group of people are back to showcase their talent on the big screen this 12th of May, 2018. Who can forget the Argument Clinic, The Upper Class Twit of the year, The Restaurant Sketch, The Lumberjack Song and Parrot Skit. The Grand Cinemas in Warwick will be screening one of their best films on the large screen, making it extra fun to watch. This cult classic will fill your evening with wedding violence, cheeky Frenchmen, shrubbery obsessed knights and silly swordplay. Take charge of your health and well being in this 2-day event, showcasing the best environment friendly services and products for living a good life. Pamper yourself on the 19th and 20th of May by exploring and experiencing different ways to better lifestyle. You will be attending free expert talks, workshops and seminars with bestselling authors, while also connecting with leading health practitioners of the city. Experience sound healing sessions, laughter yoga, music and mindfulness meditations, as you enjoy energy-free meals and vegetarian superfoods. There will be plenty of family friendly activities, suited for people of all ages. On the 20th of May, become a part of promoting an active lifestyle in the City Of Cockburn by participating in the Manning Park Trail Run in Hamilton Hill. This community health event comprises of a 5 or 10km walk or run, suited for everyone. On this route, you will encounter the challenge of the magnificent Manning Stairs, serene surroundings and spectacular views. People with disabilities or families can choose to jog or walk at least 4 times around the lake, covering same distance. Showcasing the best of Quilters in Western Australia, the QuiltWest Exhibition will take place from 23rd to 27th of May. It all began in 1976, when a residential workshop was run by the York Society at Faversham House. They were known as the ‘The West Australian Quilters Association’, who used to meet every month with an objective to advance the art of quilting and patch-working, while sharing experiences and knowledge through exhibitions. The annual exhibition will be taking place for yet another year, with the venue this time being the Perth Convention and Exhibition Centre. This family friendly festival will take place at the Boddington Rodeo Grounds on the 26th of May, providing an opportunity to enjoy medieval re-enactments, and arts and crafts fair. Spend your day delightfully, and don’t forget to deck yourself up in medieval garb. Discover the market, and be astonished at craftsmen demonstrating traditional arts. There will be knights testing their skills, role-playing and historical re-enactments all over the grand arena. Transport yourself to the medieval age and relive the culture and ethnic traditions that once existed. Enjoy the sublime music of the greats Stevie Wonder and Aretha Franklin, as the Perth Symphony Orchestra reworks the music of the most talented artists in the world. They have decided to continue with the tradition, after all that fun they had while representing George Michael’s music last year. The next concert due to happen this May on the 21st, will be featuring the works of both Franklin and Wonder. Following the sold-out show ‘Faith & Freedom’, they will be reuniting at the Astor theatre to give us the best of R&B, pop and soul!